Martin Mowforth (MM): An interview with Omar Jerónimo, from Chiquimula in Guatemala. 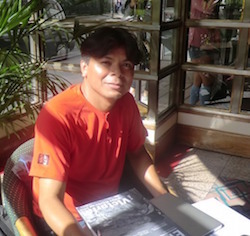 Omar Jerónimo (OJ): In Guatemala. MM: And also with Adam Lunn from Peace Brigades International, to talk about the violence of development. So, firstly, Omar, could you give me a little bit of background about your organisation, about what it does, by way of introduction, to introduce yourself? OJ: OK, well my name is Omar Jerónimo, I am a Maya Ch’orti, a Maya people in Guatemala, in the east of the country, on the Honduran border, with Copán. We work on the issue of human rights, especially the collective rights of indigenous peoples and development; and also the right to food, of Ch’ortí children in the region. This leads to doing two basic things: – one concerns justice for the violations of territorial rights of the people; and the other is to develop productive economic possibilities in a territory which is deemed the driest in Central America, developing technologies which we adopt from our Mayan knowledge of the territory. This is what I do, what the organisation is about; my educational training is in Economics and Human Rights, the two things which seem different but which are fundamental to our understanding of what is happening in this area. MM: OK, thank you and could you tell me about the most common problems faced in this area, with these organisations? OJ: Well, in principal, we are an organisation of indigenous communities, more than 70 indigenous communities. Of these, 7 indigenous communities are recognised by the state. We are in the process of getting recognition by the state, and these of course face, as do all the brothers and sisters in the country, a territorial dispute with businesses which want to establish hydroelectric and mining sites. Which are the two big economic channels of national and international capital. And, logically, far from being a possibility for development for the communities, in fact they are a tragedy for the communities. What we’ve had to face many times has been physical violence and emotional violence. Often we’ve had death threats, they’ve taken us to the courts, inventing crimes, they attack us, and they try to corrupt the communities. And often they even offer money for us to be assassinated. So, that’s development for the people, and for us it’s the biggest tragedy that could happen; and perhaps we could say that the most common theme, is not how much they attack you, but that five centuries later they still think of the Mayan people as like animals, that we don’t know how to think, that they can manipulate us, that they think we don’t know what’s good and what’s bad. And the companies and the rich people have responsibility for the country, have the right to decide for us how we should live and what’s good for us. We could say that the tragedy of five centuries is racism. It’s a far cry from real development. MM: Yes, 5 centuries of development. So, the developments at the moment are in the government’s discourse and with the companies. These are hydroelectric, mining and environmental developments? Do they have problems with the food manufacturering companies? With the farmers? OJ: This region is one of the least productive, agriculturally speaking, in the region. It suffers from constant droughts, right now we are concerned because we are already in winter [the wet season] for food production and we are suffering another drought. These are beautiful lands, rivers, mountains, hills, but they are lands which after the Conquest were left to the Maya Ch’ortí people. These lands have two fundamental virtues, and that’s water, a river which is a benefit for the people, and, of course, precious minerals. That benefit for the people has also become a tragedy for the people since the economic crisis of 2007 when the companies turned their attention to producing energy, hydroelectric energy resources and the mining of precious metals. What’s happening here is not a dispute about territory, because a dispute is when we’re not sure who owns the land and we are fighting to see who stays there. The land we have clearly belongs to the Maya Ch’ortí people, and a company called: Tres Niñas Sociedad Anónima, belonging to the Pos Gutiérrez family, which is one of the most powerful families in the country. They own more than a hundred companies, multinationals, and they’re interested in creating two hydroelectric plants in about 15 kilometres of river, incidentally the only river on this land. And so the current disputes matter because of losing the water, the only water supply for this land. And the other, less crucial, concern is the issue of mining exploration licenses on this land. The companies are active in this but the owners of at least two important licenses called La Bandera and the other Cocóta are part of the Exmingua consortium and are doing a lot of exploration with companies based in Guatemala. So, there are constant attacks to discredit us and aggression coming from this company, Las Tres Niñas Sociedad Anónima, people who say that they work with them and many times with the support of the town mayors; and they even criminalise the workers of the Public Ministry in this region..
MM: Yes, it’s the same in El Salvador, the mayors are at the beck and call of the companies. MM: But are they are mixed up with families and foreign business too? Because Las Tres Niñas, belongs to ..
OJ: To the Pos Gutiérrez. MM: A family from here. OJ: So, what happened is that right now Guatemala, for some years since we could identify where the investments came from, they established some arrangement where Guatemalan companies are associated with foreign companies; and it’s very difficult to say if there are foreign investments and where they come from. But normally the Pos Gutiérrez have investment relations with Spanish and English companies. Remembering that there is now an English company participating in investments in Guatemala together with a Colombian company. So, in Guatemala there is a very close relationship between the distributor and the producer – many times they are the same. Unión Fenosa, precisely. Unión Fenosa which was Spanish and had investments in commercialisation and distribution, but also was investing in construction. MM: Yes, it’s the same in Nicaragua. OJ: And in Guatemala, where now …. So, the banks create certain structures in such a way that access to information about who is investing, makes it very difficult for us, because also there exists a famous law in Guatemala, which is the secret bank. So nobody in Guatemala can find out who has or who is making any important bank transactions. In such a manner we can’t keep track of the transparency of investments. And this is a delicate question. What we normally say to European Governments and companies is: that no profit from money is good if it is stained with blood of innocent people. I cannot imagine eating bread covered with the blood of the people. And this is important – why? Because European governments demand transparency of information and the right of non-acceptance of violence towards the populace. This is the fundamental meaning for us. MM: And the countries which influence them bring about national commitments. OJ: Exactly. Totally, because there is the issue of not investing in companies that are not transparent. And that is a guarantee that we can only have, from the beginning, a political will from Europe to be in step with Human Rights. MM: Indeed, a question that I must mention to you is land registry and is there a programme of establishing land titles? What is happening? Is it favouring the Mayas or not? I imagine it’s not. OJ: In the Peace Accords they talk about the registration of properties. The historical problem and the greater problem, which results in many Guatemalan deaths is the agrarian problem. It’s an agrarian problem, difficult to resolve. From that they created the Registry, the RIC, the Registry of Property Information, which ought to work and be able to respond to these problems that arise from the process of land titling. Through this it also recognises that we, the Mayan peoples, exist in Guatemala, that we have our own form of organisation and property. And so it agrees that the community territories should be registered as communal lands. The Registry of property, real estate, the Registry of Land Property, the RIC – what it has done is to identify what the property is like, what are the difficulties it has. Then it informs companies which are interested in investing, gives the companies information but doesn’t give the communities information about the legal situation. This is a problem of serious corruption – it’s terrible that far from solving the conflict, it aggravates it. The Ch’ortí communities have had such an experience with the Land Registry, they’ve sought, legally, to register their communal lands in accordance with the law and its rules. And what we have found is that the RIC constantly delays the process. To date the RIC has not been able to make a single register of communal lands in Guatemala, not a single one. MM: Is the registry not promoting individual cases? OJ: Individuals. Individuals and not collectives because the discourse is always: you ought to register your lands individually, because in that way you will be able to buy and sell, or you could receive a credit. That’s the discourse which the Registry of Land Information constantly gives me; there is no possibility of considering within the process that property is a guarantee of development for communities and individuals; only a plot that can be commercialised and can have a compulsory purchase made on the people. That is the reality. In the end the RIC has become an institution which has the deepest distrust of the communities towards it. MM: And does the RIC only have funds from the Guatemalan Government or does it have funds from the World Bank? OJ: Its funds are credits from the World Bank. And other funds are joint, and jointly all the credits that it had for the Ch’orti territory were for the measuring of the community lands. In fact they haven’t managed a single community land measurement; the credit has been used up. And we have said to the World Bank that it cannot continue to finance irresponsible organisations. Because it not only corrupts the state institution but also it puts the people into debt without having any significant result in terms of the land. And this, perhaps, this year is going to be a process that we are going to engage various organisations in dialogue about this with the World Bank – how the awarding of credit should be. MM: A more specific question: do you have problems with the timber industry too? MM: Yes? They do too, OK.
OJ: The Ch’ortí territory has one of the most important mountains of Central America and that’s El Merendo Mountain. This mountain, El Merendo, has a cloud forest, the fifth largest in Central America. And it has a rich and unique ecosystem. And naturally it is an area that supplies drinking water to more than 300,000 inhabitants. And these inhabitants are at risk from logging companies like Aracel Alto, and some private fincas who sell valuable wood. They are constantly felling. The Ch’ortí communities and some rural groups, mestizos, from Secampa, have opposed this, and we have told the Government that it should be declared a protected area, a community administration, this unique space of forest, untouched and unique in the east of the country. Not to do it is to put at risk thousands and thousands of people. The response has been, constantly, that the State can do nothing. To jail leaders like José Pilar, Álvarez Cabrela who is a Lutheran priest who has been close to the communities and is alongside other community leaders who are constantly being threatened with death. And this, in total impunity. Many of the unknown who threaten us are relatives of judges, people inside the of the Public Ministry, friends of the Governors or deputies. So, essentially no, this corrupt system which is now also in dispute throughout Guatemala, and is taking to court various dubious locals and including even the President, is what provokes these constant ecological tragedies. One such is that happening now in Trigo la Pasión in Guatemala, which is causing 200km of contamination by palm oil. MM: Yes. I was going to ask you about palm oil. I’ve seen it in Olancho in Honduras, and after after the coup d’état in Honduras, they took the liberty of starting their illegal activities again. And I was wondering if it’s the same in Guatemala, I imagine it is, for sure. Another thing, a little difficult. What is the situation with regard to construction or the plans for hydroelectricity? What is the situation like? OJ: One of the advantages of this territory is that the communities are very well organised. There are communities well known to each other. And they have not allowed these companies to begin working for nearly nine years. For nine years these companies have been constantly aggressive, constantly taking the leaders to the courts. At the moment we have two indigenous brothers in jail, accused of a killing that they did not commit. And the judge has sentenced them without proof. And so even with all this aggression, the companies haven’t managed to establish themselves. The communities believe that the best kind of company is one that isn’t able to enter the area, you see? Because if they get established they begin to have armed internal groups which then are against the communities. So these communities have understood that this has happened to their country. In the country the companies arrive, establish armed groups, begin to kill, to assassinate, to imprison. As in Santa Rosa where the Chief of Security is in jail. We have learned of these things, these stories from other territories, and we have undertaken a constant action not to allow them entry and to denounce the violence of these companies. In this way we don’t give any shelter in the region, and we are constantly calling attention to the municipal mayors, who even though they are in agreement with the companies, don’t give legal permits for them to become established. And the mayors know that the communities are not likely to vote for them if they give legal permission. And because of this they haven’t allowed them to give permissions. But it’s every day, every day a constant work and aggression. MM: Yes. So, this, I imagine, is hard for the communities, for the people of the communities – they have to struggle every day, daily. OJ: And every day they are under attack. Fifteen days ago, a son of one of the indigenous authority of Cuarecuche, a Ch’ortí mayor in Cocotá, they came into his house and killed him at night. And the question arises, Who was it? Well, people who work with the mayors who were in agreement with the company. Why did they kill him? Because, essentially, they didn’t agree with him. So, in the first declaration the assassin made to the Jury for the community, is that they paid me to do it. A value less than 10 euros in Guatemala. But when the Public Ministry made the accusation against the perpetrator, the assassin, they made it for minor offences. What is a minor offence? A minor offence is when someone treats me badly or someone who pushed me, and I can get off with a fine. However, in Guatemala a minor offence is murder! OJ: I said, the lawyers have acted in this. MM: Can you refer these cases to the CICIG? OJ: What happens is that the CICIG works on the issue of organised crime which is inside the structures of the State, without question. One such case is the customs fraud which has been one of the most important scandals in Guatemala to have raised the awareness of the people. The case of the Guatemalan Institute of Social Security, this type of internal criminal network that the mayors have, it’s probable that that’s how it started. On the issue of Human Rights, cases of people killed for their involvement in defending rights, don’t have any realistic chance of being investigated in Guatemala. There is a help system for people defending human rights, but I presented a case two years ago of a death threat which offered a hundred thousand dollars for my death. Well the two years have passed and no one has said whether they have investigated my case. So, if the defenders who can make denunciations get nowhere, then no, they are not investigating our situation. The brothers in the community are totally unprotected legally. MM: So, are they able to make use of the resources of any international organisations? OJ: Yes, this is important, when you were just talking about the networks, that the organisations of people who are collaborating. We appreciate this and appreciate it deeply for two basic reasons. Many people in America perhaps know us, but understand that there is a risk in this universal work, the work of defending human rights. And this is what we appreciate deeply. And secondly, sadly, those governments which could denounce what is happening in America and could discuss with governments which violate human rights are yours. You who could be here, who could make it across a network, perhaps electronic, to get closer to those who govern. Because for us, the only tool we have to defend ourselves is the accompaniment of organisations, international organisations for human rights. It’s our only tool. We cannot believe in the Guatemalan State, we can’t believe in anything more than our own community organised networks and in the solidarity and support of the organisations which accompany us. MM: And, you have been an accompanier too, Adam – for a long time? Adam Lunn (AL): In 2002. MM: And so, how much time have you spent? And you’ve worked with ….? AL: Well, I spent a year in Guatemala and now in the PBI office. And there I was working with the CCCND. MM: And, your accompaniers have to be trained before going, and they spend a year there, always? Or ….? MM: My reason for asking is that I would like to write a little article about the PBI. So, it’s important to clarify for people that it’s not something you can do in a weekend. We need much more, it’s a solid commitment, very solid. And it’s not a short experience for students. AL: A year, it’s a full year for the accompaniers, it’s quite a difficult year, isn’t it? Because it sometimes puts people into difficult moments of conflict. When aggressions occur they have to know that they are there for nothing more than observing the situation. It is perhaps one of the most important challenges of all. MM: So, Omar, do you think that, when you return to your situation is it going to be a little better? Your level of threat or your level of danger? The same, I imagine, but, I suppose that the reason for my question is to ask if it has been useful, a good thing, this visit to Europe? OJ: For us, the most important objective we have when we come is to tell the history of our communities. No, we don’t dream of anything more than telling, that our voice is heard elsewhere. That at least our version of what is happening is heard. Normally, it’s only the voice of the companies, of the governments, that is heard, but not the voice of the people. We make an effort to be the spokesperson of these communities. Perhaps we don’t do it well, perhaps we make mistakes, but perhaps when I get back I’m going to be able to say that we achieved the objective of giving the community’s version. With that I think that the objective has been achieved. And secondly, if this happens, and we see the intimidations diminishing, we believe this is a good outcome, is it not? But, a lot of the time it’s not in the hands of the people outside or in our own hands, but rather in the thoughts of the people who attack us, right?. So, these are things which are difficult for us to gauge; we ask only that what we can tell is heard. MM: Yes, so often. So, when you go back, I imagine that …. – what are your problems going to be, the biggest that you will encounter? OJ: Yes, when last year I visited various other countries, and when we returned home, what we found was that the company was bad-mouthing us, saying that we were coming here to get money, that we were getting a lot of money. We could say it was a smear campaign, and these are always things that happen when we return. The important thing for us is that we know what we do. And to have the security of knowing that what we did was thinking of the community. So, it could be that when I get back I meet even worse attacks because they don’t like someone giving the version of the community. Or it could be that I find that the owners are thinking how they might get away with doing these things. Because an important thing that we ask of them is that it is important that they talk to the people truthfully, tell the people that that is what they’re going to do, what it’s for, what it’s not for. And if the people have the information as it is accept the project, then they do it with the information, aware of its effects. But if the people knowing the effects don’t accept it, it’s the company’s responsibility to accept that they don’t want it. And that is the basic formula of democracy, to respect the decision of the people. MM: Yes, to go ahead being informed. OJ: And this is what we constantly ask of the companies, we don’t ask anything else of them, only that they be honest and transparent. We believe that honest and transparent businesses are more useful than those which try to corrupt world systems. MM: Thanks very much. Do you have reports for people? AL: Yes, we have an operation called Alerts. And, a year ago we sent out an alert, specifically about the situation of resistance. We had a very serious case of attacks and threats, between March and November we had 109 cases. And every three days someone here is threatened, is slandered, and we sent out an alert about the high risk situation. So, also there was and is a situation in Guatemala where last year we had a general deterioration of the general human rights situation. There were very, very serious situations where they weren’t just attacks, but also a violent displacement of the social organisation, an increase in criminal activities and also of denunciations against civil society. MM: Perhaps you could add the name of ENCA to your email list. We have a list of people who are relatively active – relatively. We try to do a lot but we are all volunteers, but we are also active too; we try to respond to this kind of alert or action in general. So I could give you the email addresses of this group. I say this, because we have another group who are relatively inactive. Alerts to this address go to more or less 20 to 30 people. The majority of them will probably respond. And the other thing is that, if there is news from your campaigns, your struggles, your problems, or whatever, I would like to give you my email as well. OJ: Likewise I’ll write to tell you about it. MM: And the problems there might be with the dialogue. I could explain a little about your experiences with the dialogues, yes? MM: Maybe, Omar, you can explain a little about the process of dialogue with the communities affected by the disorders. OJ: Firstly it needs to be said that dialogue is not perhaps the most appropriate word in Guatemala to describe the moments when we have tried to talk about the problems with the State, the companies and the communities. Since 2004 I have participated in hundreds of roundtables where dialogue on particular issues has been established by addressing each theme, especially agriculture, mining, hydroelectricity, monocultures in the country. And always we finish with the feeling that these committees serve only to delay discussions, to identify those who are the leaders of the community and to be able to know what are the needs of these leaders and how they can be manipulated. It’s about being able to identify those who can be threatened later, imprisoned and criminalised. Or to identify particular moments, or type of language they could use – these people who are involved in the dialogue are those who threaten and it enables them to make a legal case against them. Very often it’s these people who are at the roundtable dialogues who later are captured and put in prison. So, there has never been a process of dialogue in Guatemala. And, it’s exactly because the communities are considered not to have any rights, they don’t have claims and it’s not necessary to have a dialogue with them. And all our life we have believed that dialogue is the fundamental tool to construct democracy – it is our approach; and even after all the times we have been disillusioned after finishing talking, we have returned to the table. Not naively, not because we don’t know how the processes will finish, but because we believe it is a fundamental tool we have to use. In the last three years of General Otto Peréz Molina’s government, the dialogue has suffered a deep setback in which the companies have become involved in these conversations. We believe that when we are talking about the future of these communities, the companies should not be involved, it should be the government and the communities. That is to say, it should be the government and the townspeople, not the companies and the townspeople. The government ought to be the guarantor of rights, and not the mediator of rights. And the Guatemalan Government has established itself as the mediator of rights between the companies and the communities. And very often a mediator favours the side of the companies. A State cannot take a stance in favour of a company, instead it should be a stance in favour of the wellbeing of the population, which is a substantial difference. Secondly, a State ought to guarantee Human Rights and the rights of the population before the rights of whatever company. That hasn’t been the fundamental principle of conversations in Guatemala. Rather it is these principles which the processes of dialogue are always considering as a fundamental premise; that the communities don’t understand, don’t listen, don’t need to be informed, because they are not going to understand, that they are manipulated by leaders, by foreigners sometimes, by communists, and that it’s necessary to talk with these manipulators and not with the community. And in that way, they see it as the companies which have the solution to the problems of the communities. And so the dialogues are not to see what sort of dreams, objectives, aspirations, plans the communities have, rather it is to inform them that they are going to be evicted and prosecuted. There isn’t and there hasn’t been perhaps in Guatemala since the Peace Treaties, a single roundtable dialogue which has been a listening dialogue, for both parties to listen to each other and come to understand each other’s position. Instead they are essentially spaces where the companies can, with impunity, often threaten people. We have suffered in many arbitration roundtable meetings, in which the indigenous communities have been cited by the Public Ministry, and the companies with their lawyers, managers of the companies and lawyers are in the Offices of the Public Ministry to threaten community leaders in the Public Ministry. Saying to them “If you don’t let the companies get on with their work you are going to be responsible for all we have invested, then you will have to pay for it. And if you don’t pay you’ll got to prison”. That’s how the dialogue finishes.